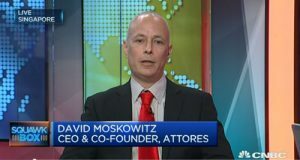 CoinGecko recently interviewed David Moskowitz, co-founder of Attores, a digital signing platform powered by smart contracts on the Etheruem blockchain that is based in Singapore. David was previously the founder of CoinRepublic, a Singapore Bitcoin broker that was sold to Mexican Bitcoin exchange, meXBT. 1. What is Attores and what does it do? Attores is a digital signing and documents management platform, powered by smart contracts and blockchain technology. We are using the Ethereum blockchain for the public applications. We provide a full suite of services for documents: uploading, sending, signing and securing using smart contracts and blockchain to create an audit trail of transactions - and prove origination of the documents. We also provide an API so that application developers can use our digital signing and document management solution seamlessly and securely. Many businesses of various sizes are still not using a digital content management and signing systems for their documents in an efficient way. We have seen this from the smallest one person freelancer all the way up to a multi-million dollar corporation. 2. Why should I consider signing documents digitally on Attores? Our use of smart contracts and blockchain create a trustless audit trail of the history of the document. All signings are transactions placed into a smart contract. Our platform provides a clean, easy to use interface for all your digital signing needs, and our API allows you to add this functionality and security to your applications. As compared to other similar solutions in the space, we remove all the fluff and give you a clean and efficient solution for all your document needs. 3. Can you demonstrate some easy steps on how easy it is to use Attores? 4. Are contracts signed on the Attores applicable in courts? Yes, almost all jurisdictions (all major ones, like the EU, UK, US, Singapore, Australia etc.) recognize e-signing as an acceptable replacement for in-person signatures. There are a few exceptions for things like immovable property sales (selling your home), but for almost all other agreements, it is valid. 5. It seems like Attores competes against HelloSign. The big difference is that HelloSign stores data in a centralised database but Attores on the Ethereum blockchain. Are the statements accurate? Yes, by using the blockchain, we create a trustless audit trail all the way back to the initiator of the agreement. By using a public blockchain, the transactions can be verified without Attores. 6. How can one verify that the contract has been signed and placed onto the Ethereum blockchain without using Attores? You can absolutely do this without using Attores. For every signature we generate a unique transaction hash, which you can verify on blockchain explorers like etherscan and ethercamp. This is the core premise of our entire platform. While we make it easy to deploy the transactions and deal with the blockchain, Attores is not required to deal with those deployed contracts. 7. Are there any plans to allow users to sign documents directly from a link in email without creating an Attores account? Yes, some users have requested it, and it is now available. We have also just added ‘in person’ signing. We have deployed a feature where a user can sign without creating an account first from a direct link in the email with a unique token. While creating an account is encouraged, it is not a must. 8. What are the security measures in place on Attores to ensure that the person signing is the actual person who is supposed to sign? For every signature transaction, we tie it with the email ID of the user. For non ‘in-person’ signings, we link all transactions back to the email of the signer, and also log the IP and timestamp of the signer. 9. What are the development plans for Attores in the coming year? We’ll continue to add features as requested by the users of the platform and make further use of the advantages inherent in blockchain. One example is the recent launch of our new ‘certificate of accomplishment’ issuance system. This allows organizations to issue digital certificates and diplomas - with the receiver able to post this to their Linkedin profile or share with potential employers. The receiver can then verify that the certificate was in fact issued by the organization as the blockchain proves origination of the certificate.